If you’d spent the last few years of your life wrapped up in an album like Star Of Love, you’d go looking for a little respite, too. Crystal Fighters’ debut was the product of minds made manic by a deluge of fresh experience, both in the studio and on the road. It was inspired by an opera written by a man whose sanity disintegrated before he could finish it. It seemed to be influenced just as much by traditional Basque music from the 18th century as it was modern-day clubland, and contained residual traces of every genre, scene, style or party that had existed in-between. 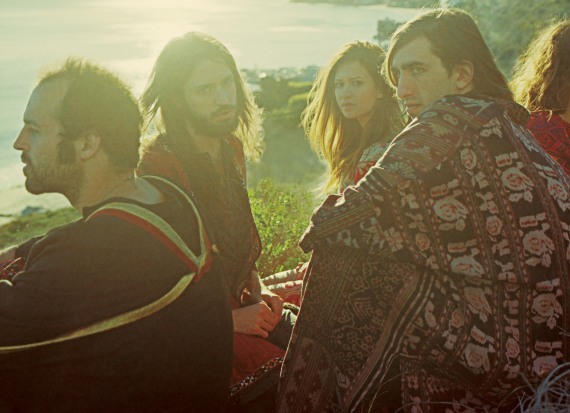 To write the album, Crystal Fighters retreated to the Basque hills that they consider to be their spiritual home. Their music has always born traces of the local sound –traditional instruments like txalapartas and txistus vying in the mix with razor’s edge guitars and percolating techno synths – but the purpose of this mission was different. Immersed in their creative cradle, they wanted to tap into something beyond their immediate experience, to uproot themselves from temporal bounds in order to write timeless songs. These methods proved to be spectacularly successful – Crystal Fighters wrote Cave Rave in its entirety during this two-month spell. There followed a quick detour to Los Angeles to produce the tracks, but after this it was still the songs written in the Basque country that remained most audible – only now the melodies found there had been sharpened into hooks, songs exploded into towering anthems. This revelatory process also exposed the band to a new way of thinking: a realisation that even the cultures they considered traditional are comparatively new. The album draws deeper into universal, history-permeating themes of love, death, insanity and hope; using Basque culture as a stepping stone backward to the spiritual and primal. The musical influences have widened too. Star Of Love was a manic, genre picking rush yet Cave Rave expands the sound palette even further. The beating hearts of Hispanic and African dance and Mexican electronic music 3bal now sit alongside folk and psychedelia, each artfully interpreted and united by the band’s unconfined vision. If Crystal Fighters have surrendered to the power of the song, they haven’t run up the white flag in terms of energy. What’s here is still an adrenal rush, and there is an awful lot here: the grandstanding of American road rock, the sweat of disco, the fervent initiative of punk, the house of Iberian twilights that anticipates everything coming very soon, all at once. What’s changed is Crystal Fighters’ ability to control those surges – and as such Cave Rave feels a considerably more thoughtful and contemplative album than its predecessor. Nevertheless, it has at its heart the same tension that provides all great records their emotional traction. Sebastian Pringle, Gilbert Vierich, and Graham Dickson are the three core members of Crystal Fighters, around whom a larger cadre of vocalists and instrumentalists revolve. They’re the kind of people whose brains seem to be bubbling pots, all intensely preoccupied with anthropology, time travel, spirituality and their place in the universe, even as they’re attempting to create the kind of cohesive sonic pieces that really connect and move people. They seem passionate about creating music that can make people dance, but that is equally adept at finding its way beneath a listener’s skin. With Cave Rave, they Pringle, Vierich and Dickson have managed just that. The melodies, hooks and refrains of the album are so compelling it’s almost as if Crystal Fighters had to devise them simply to navigate a way across the landscapes of their own avid genrelessness, to remain as masters of music that itself seems to be a disputed territory. Here you have a band hell-bent on locating their own musical heaven, a place beyond petty genre parameters, where all that remains, finally, is song, rhythm and sentiment, bursting in vivid colour from the dark of the silent Basque night.